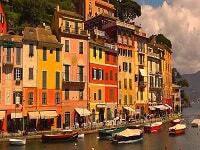 On this delightful Tuscany and Umbria tours package explore two fascinating Italian regions. Umbria is located right in the center of Italy. Tuscany is located north of Rome along the Mediterranean Coast. Tuscany and Umbria both reveal the secrets of life from the ancient Etruscans. 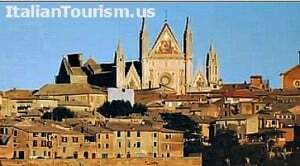 Italy travelers love to explore Umbria’s and Tuscany’s beautiful medieval and renaissance towns. 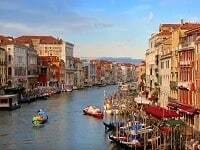 This Italy Tour package includes visits to Assisi, Cortona, Deruta, Montalcino, Orvieto, Perugia, Pienza, San Gimignano, Siena, Spello, Spoleto, and Volterra. The region’s rolling hills and extensive histories make them each authentic Italy vacation destinations. There is also a three day extension available to southern Italy’s famed resort town Sorrento. If you prefer an escorted tour of Tuscany only click to review our Tuscany tour package. 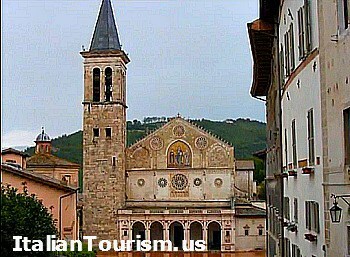 To book your Tuscany and Umbria tours package call 800-227-1577 or submit the form for escorted tour price with airfare from your home airport. Meals include breakfast daily, 2 lunches and 5 dinners. VIP Access – Skip the lines and get special treatment at the must-see attractions. Perfect Hotels – We’ve done the work to find just the right hotels in just the right locations. Tour Directors – Take your heads out of the guidebook and let expert guides make every destination fascinating. Transportation – Leave the navigating to us – and just sit back and enjoy the ride. Enjoy an authentic and delicious Umbrian dinner in a charming hill town. Experience one of the most classical and well preserved & best known medieval walled town, Monteriggioni followed by a delicious dinner. Enjoy an evening in a traditional restaurant, renowned for its cuisine and excellent service. Enjoy a lovely pizza meal in an elegant restaurant in the center of Sorrento with bright dining rooms and outdoor seating. A real treat that cannot be missed. Enjoy an evening of Neapolitan songs and dances. Enjoy 1-hour private shooting in Sorrento with a professional photographer followed by a glass of Prosecco. Do you like Italian food but you’re not very talented at preparing it? Well then this is the place for you! Put your hands on the ingredients to create your own meal, under the expert guidance of our Chefs. Your private Local Guide will show you this jewel of the Mediterranean Sea, including the beautiful and historical areas, bringing to life this magical island. Visit this amazing archaeological area with an expert Local Guide. Immeasurable treasure of art and history, the excavations of Herculaneum give us an ancient and beautiful city founded by the Greeks on the shores of the sea. Learn the culinary classics of Pasta and Gnocchi to experience what real Italians eat! Buonissimo! 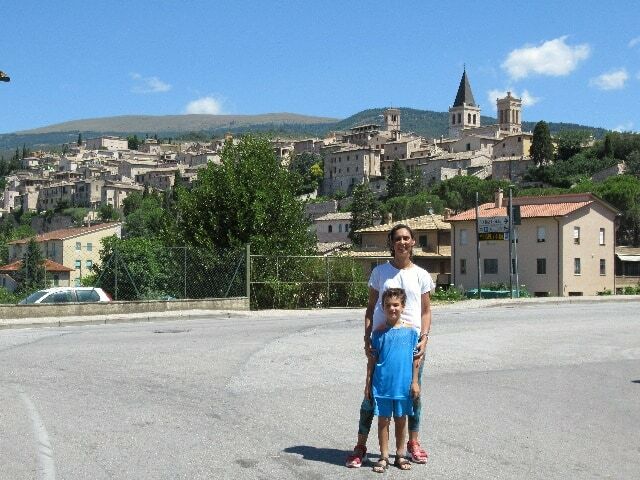 Check the box next to the departure date of the Umbria tour you would like to join. Submit form for Umbria and Tuscany tour with air price and air itinerary. The Tuscany and Umbria tours package may include airfare from your city. 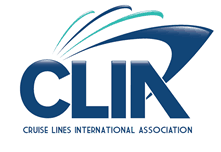 Click submit Italy airfare and itinerary. Your discovery of Italy’s “green heart” the region of Umbria begins in the hilltop town of Narni, almost 800 feet high. Enjoy a guided visit of the CONVENT OF SAN DOMENICO basement, and see a cell where prisoners of the Inquisition wrote graffiti on the walls. Then, a true highlight: learn the art of homemade Manfricolo pasta from a chef during a PASTA DEMONSTRATION, and, of course, enjoy lunch afterwards. Next is Spoleto, a former Roman municipalism and capital of an important Lombard duchy from the 6th to the 8th centuries. During your walking tour with a Local Guide, take pictures of La Rocca, the former Papal fortress that was used as a high-security prison until 1982; admire the Ponte delle Torri, erected on the foundations of a Roman aqueduct; and visit PIAZZA DEL DUOMO. This evening, a special dinner with wine awaits you at a local restaurant. In the pretty town of Spello, enjoy a tour and an OLIVE OIL TASTING at an authentic oil mill. Time for lunch and to browse through the little shops before continuing to Assisi. Start your guided walking tour with visits to ST. CLARE’S CHURCH and ST. FRANCIS’ BASILICA, the hub of a religious order devoted to the ideals of humility, forgiveness, simplicity, and love for all God’s creatures. A short drive brings you to Perugia, capital of Umbria and an important university town. A guided walking tour features the PIAZZA IV NOVEMBRE, one of the grandest squares in Italy, graced by the Fontana Maggiore. Admire the gothic cathedral, the Galleria Nazionale dell’Umbria, and Perugia’s stunning medieval municipal palace. Then, a special treat: visit the original PERUGINA BACI CHOCOLATE FACTORY, and taste Italy’s most delectable candy. This afternoon there is an optional tour to Deruta, famous for its ceramics, and have dinner at a local taverna. Enter Tuscany, and stop in the town of Cortona, made famous by the movie Under the Tuscan Sun and see Villa Bramasole, where the author of the book used to live. Arrive in Siena, and follow your Local Guide on a walk through ancient, narrow lanes to PIAZZA DEL CAMPO. Hear about the biannual Palio, Siena’s spectacular medieval-style horse race that is held on this square. This evening, an optional dinner outing to Monteriggioni is available. A scenic day begins with a visit to Volterra, the center of Etruscan civilization. After you’ll visit the hilltop town San Gimignano, the most picturesque of Italy’s perfectly preserved medieval towns. It is famous for its tower houses often called a medieval Manhattan. After a full day touring Tuscany you’ll return to Siena. Famous for pecorino cheese, Pienza has been listed as a UNESCO World Heritage Site, thanks to a member of the Piccolomini family who became Pope Pius II in the 15th century and redesigned the town in perfect renaissance style. Continue to Montalcino, beautifully located in the Tuscan Hills, and enjoy a Brunello WINE TASTING, followed by lunch in a family-owned estate. On to Orvieto, perched high atop a volcanic rock. Access, denied to many a would-be conqueror through the ages, is easy for you. Ride a modern FUNICULAR right through the forbidding ramparts, where a unique visit to the Etruscan underground Labirinto (labyrinth) awaits you. This evening, an exclusive dinner has been prepared for you by the famous Italian chef. Hear the history of this fascinating town from your Local Guide during a pleasant walk through the narrow lanes and visit the CATHEDRAL with its San Brizio Chapel. Return to the “Eternal City” for a drive past Rome’s main highlights, ending at ST. PETER’S SQUARE. A special farewell dinner with wine at a local restaurant awaits you to celebrate the success of your vacation in Umbria and Tuscany. Your vacation ends with breakfast this morning. 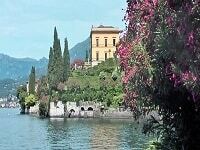 Or you may continue with the tour for a three-day extension to southern Italy to the resort town of Sorrento. You’ll travel by high-speed train to Naples then transfer to Sorrento. For the price of the Sorrento extension submit the form and note Sorrento Extension in the special request. Morning guided walking tour through the OLD TOWN. Take pictures of Mount Vesuvius and visit the cloister of St. Francis Church before tasting locally produced LIMONCELLO. Your Local Host will have many suggestions for your day at leisure. You can tour Pompeii, take a hydrofoil to Capri, drive town the Amalfi Coast, or visit Naples. 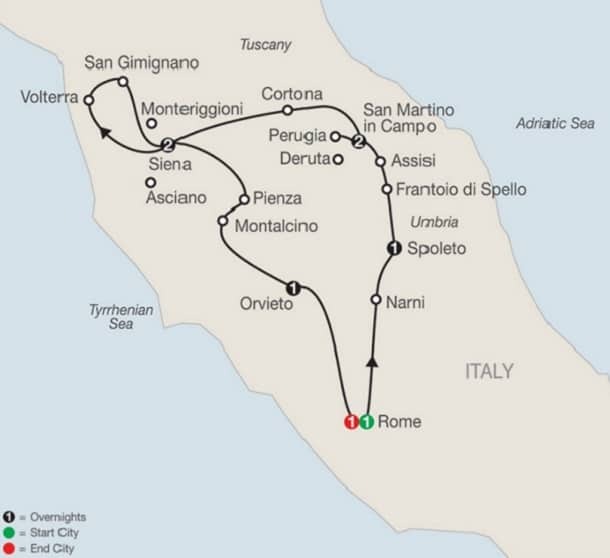 Check out the Sorrento optional tours to arrange before you depart. Your vacation ends with breakfast this morning (the nearest airport is Naples).